Now and then, I read that the Berliner Philharmoniker philharmonic orchestra has supposedly presented a symphony “perfectly.” Such false praise sounds to me like an insult based on lack of judgment. To me, Berlin vernacular appears to be better informed in this case, having described the Berliner Philharmonie concert hall – in mild but accurate derision – as “Circus Karajani” (a play on words on the popular Circus Sarrasani, of course) at the time of its opening concert in 1963. Unmistakable: the building designed by architect Hans Scharoun (1893 to 1972) is reminiscent of a circus tent. And the central orchestral podium with its upwardly inclined loge terraces on all sides (at the time a world first) absolutely has something of a circus arena about it. Indeed, comparing Herbert von Karajan (principal conductor until 1989) to a circus ringmaster or conjuror says more about his work than many a biography. 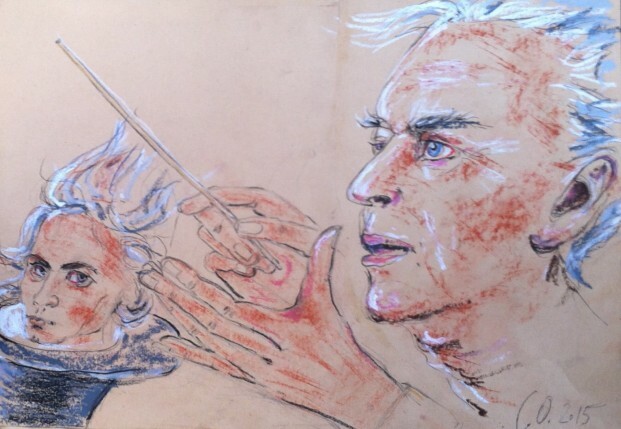 Yes, it was about magic for Karajan. The audience should sit stunned and open-mouthed, like children at the circus, when he, the magician, brought to life in a way that no ear had previously experienced it a Beethoven symphony already heard a hundred times before. After all, you don’t listen to the Berliner Philharmoniker as private tutoring for music lessons. You might require technical perfection from your washing machine, but in the concert hall, you want to bear witness to a miracle. “The way this unique conductor leads the orchestra with his magic wand is hard to describe …,” the Berliner Courier exulted in 1888. So, even back then, there was a conjuror on the podium: as the first principal conductor, Hans von Bülow (1830 to 1894), a pupil of Richard Wagner and Franz Liszt and himself a renowned pianist, led the Philharmoniker (which was still known as the Berliner Philharmonisches Orchester ‘Berlin Philharmonic Orchestra’ at the time) in the hall of a former roller-skating rink. After von Bülow’s death, the composer Richard Strauss (1864 to 1949) conducted the majority of the concerts until Arthur Nikisch (1855 to 1922) took on the position of “principal conductor for life.” The cosmopolitan Nikisch took the orchestra to guest appearances in Switzerland, France, Belgium, Italy, Spain, Portugal, and Russia, and invited international stars such as Pau Casals and the 11-year-old Jascha Heifetz to play in Berlin. Nikisch and the Philharmoniker first recorded an entire symphony for gramophone with Beethoven’s Fifth in 1913. Later, under the leadership of Karajan, sound recordings would contribute to the worldwide fame of the orchestra. Furtwängler had always seen Arthur Nikisch as a role model. He in turn was strongly influenced by the style of Felix Mottl (1856 to 1911), who considered himself beholden to the music dramas of Richard Wagner and the symphonies of Anton Bruckner. He internalized Wagner’s idea that music served salvation. Embarrassingly, it did not save a single one of the many millions of victims of the Holocaust and the Second World War. Like Beethoven before him, Furtwängler sought to make the profound thoughts and feelings hidden in musical scores audible. As a composer himself, he saw conducting as a creative act. For him, interpretation was also a matter of intuition and improvisation. He instructed his Philharmoniker to only play what they themselves felt. He intentionally kept the beat “vague,” in order to turn the metronomic balance into a musical flow (almost like jazz). Furtwängler’s free arrangements of dynamics and tempos have been praised and maligned almost in equal measure. Music theorist Heinrich Schenker called him the “only composer who really understood Beethoven,” and Maria Callas has similarly been quoted as saying “For me, he was Beethoven,” (from John Ardion’s The Furtwängler Record, 1994). Furtwängler was extremely highly regarded by many musical greats, including Arnold Schönberg, Paul Hindemith, Arthur Honegger, Dietrich Fischer-Dieskau, Elisabeth Schwarzkopf, and last but not least, Yehudi Menuhin. Furtwängler invited him to Berlin as early as 1929, at which time the 12-year-old child prodigy Yehudi played violin concertos by Bach, Beethoven, and Brahms under the stewardship of Bruno Walter. It was also Menuhin who returned to Berlin in 1947 as a demonstration of solidarity as a Jew with Furtwängler. Had the maestro not spoken out against the ban on his Jewish orchestra members as early as April 1933 with his open letter (in the Berliner Tageblatt) to the Reich Minister of Propaganda, Joseph Goebbels? And in doing so, did he not ensure that – at least to begin with – the “Aryan paragraph” was not applied? And had he not resigned from his positions as leader of the Berlin Philharmonic Orchestra, head of the State Opera, and Vice President of the Reich Chamber of Music? A kick in the teeth for Hitler and his cronies? More like the equivalent of a butterfly breaking wind. The Nazi head honchos Hitler, Göring, and Goebbels quickly placed him on their official “List of the divine” and the “Special list of the three most important musicians on the list of the divine.” Embraces that only served to smother the recipient. Furtwängler did have the opportunity to take over leadership of the New York Philharmonic in 1936, as successor to Toscanini. Furtwängler turned down the offer. “There was an incomparable artist … living under the rule of the National Socialists, and he refused … to confirm … to them – the emigrants – in that way … that he turns his back on barbarism,” bemoans Fred K. Prieberg in Kraftprobe. Wilhelm Furtwängler im Dritten Reich, 1986. Furtwängler’s successor, Karajan, also had to live with the accusation of perhaps having shown a little too much ambition in Nazi Germany. After the death of Wilhelm Furtwängler in 1954, the Berliner Philharmoniker did not select Sergiu Celibidache (who had conducted the orchestra while Furtwängler was banned from performing from 1947 to 1952), but Herbert von Karajan (1908 to 1989) as his successor. Karajan was the more renowned of the two. As early as 1938, after he conducted Wagner’s Tristan and Isolde in Berlin, the press labeled him “Wonder Karajan.” In 1939, Hitler gave him the title of Staatskapellmeister (State bandmaster), but then dropped him like a hot potato because Karajan had supposedly given the wrong cues in Wagner’s Meistersinger, an opera on which the GRÖFAZ (größten Feldherrn aller Zeiten – “the greatest field commander of all time” – as Kurt Tucholsky derisively referred to the Führer) considered himself an expert. Karajan survived. The Third Reich needed to uphold the glory of its star composer, who (unlike Furtwängler) was also a party member. Now, after the war, the Berliner Philharmoniker had hit the jackpot with the choice of Karajan as “musical leader for life.” In contrast to the gramophone record cynic Celibidache, in Karajan they found a highly enterprising promoter of marketable concert recordings. He recorded around 700 works from 130 composers, which sold around 300 million copies worldwide. The Deutsche Grammophon label alone is estimated to have made a third of its sales (between 1960 and 2008) thanks to him. Beethoven, who had to count every penny throughout his lifetime, would have rejoiced at finally being able to match the Beatles in financial terms. The orchestra members were also showered with money, which they allowed to rain down on them, but not to corrupt them. After all, the scandal relating to the clarinetist Sabine Meyer is spoken of to this day. Karajan insisted on bringing her into the orchestra, and tried to add force to his argument with blackmail. “Ladies and Gentlemen,” the maestro threatened in a letter of December 3, 1982, “the orchestra tours, the Salzburg and Lucerne festivals, the recordings of operas and concerts for television and film, and the whole complex of audiovisual productions have been suspended of today as a consequence of the existing situation,” (quoted by Deike Diening in Der Tagesspiegel on 08/26/2007). Karajan’s cleverness is also to thank for the fact that the Berliner Philharmoniker was able to bring the first audio CD recording in the world to the market in 1982, with An Alpine Symphony by Richard Strauss. And with its Digital Concert Hall, the Stiftung Berliner Philharmoniker foundation has been providing its audience with the opportunity to experience live concerts online since July 2014. Also included are archive recordings in full-HD quality, among them Karajan concerts from the 1960s and 1970s. Herbert von Karajan led and characterized the Berliner Philharmoniker for 34 years. But what remains of him? Overly idolized by his contemporaries, he was unfairly underestimated by the subsequent generation of critics and listeners to the same extent. Of course, the total commitment to euphony in his musical approach did not suit the zeitgeist. Even Igor Stravinsky denied that “Le Sacre can be satisfactorily performed in the tradition of Herr von Karajan,” (quoted by Holmes: Conductors on Record, London 1988, p 126). Was he really only a master of 19th-century music? Exemplary with Verdi and Wagner, a genius in his interpretation of Richard Strauss and Jean Sibelius, but averse to any form of modernity? For him, the natural power of every symphony should unfurl like a storm or a strong tide. He always had whole movements recorded live, never allowing individual passages to be repeated and put together as audio snippets – as some of his colleagues preferred to do things. As a rule, he gave his orchestra no cues; each musician should – as he did – learn the score by heart and listen carefully to their fellow musicians. However, this required acoustics that allowed all orchestra members to perceive all the others. That is why he encouraged the head of construction for the new Philharmonie, Hans Scharoun, to make use of architecture working “from the inside out.” In this way, the convex reflectors hanging above the stage primarily serve to ensure that the instrumentalists can hear each other. Karajan’s music had to sparkle, shine, and glisten with never-before-heard beauty – as was expected from a sound magician. He loathed ambient noise, such as that from the valves of the wind section; no soloist would have dared to hum along to the melodies (like Glenn Gould or Casals). Because of this, critics held his “high-gloss sound” against him, claiming he served up “classical à la Hollywood” rather than faithfulness to the original. After Nikolaus Harnoncourt (who had once applied to be a cellist for Karajan) showed the audacity to perform J.S. Bach on baroque instruments in historically informed style and characterize Mozart as a dramatist writing a tonal language, rather than as an esthete, Karajan’s conducting appeared to have gone out of fashion. After Karajan’s death in 1989, the Berliner Philharmoniker chose Claudio Abbado (1933 to 2014) as his successor as principal conductor. In addition to the classic repertoire, he was also very committed to the modern: Gustav Mahler and Dmitri Shostakovich, among others. Abbado had already worked together closely with the contemporary composers Boulez, Berio, Nono, and Stockhausen in Vienna. Compared to that, Karajan seemed all too backward-looking. But he, too, had left behind some modern reference recordings for posterity, including Claude Debussy’s lyrical drama Pelléas et Mélisande, Maurice Ravel’s Boléro, and the recording of Arnold Schönberg’s Variations for Orchestra, Op. 31, with which he and the Berliner Philharmoniker proved how captivatingly beautiful even atonal music can be – if you play it the right way. Abbado rejuvenated the orchestra, replacing half of the members. Today, 143 years after it was founded, the Berliner Philharmoniker has 128 orchestra members, 19 of whom are female. In 2002, Abbado, who was suffering from cancer, was replaced on the principal conductor’s podium by the Brit Simon Rattle (born 1955). Rattle’s conditions included a reorganization of the orchestra. The Berliner Philharmoniker had, up to that point, functioned as a nontrading partnership organized under the German Civil Code, whose income from the sale of recordings (records, videos, etc.) did not reach the Berlin city authorities, while a parallel organization, the Berliner Philharmonische Orchester, was subordinated to the Berlin senate chancellery for cultural affairs, which had to pay, among other things, the musicians’ fees. Now, both companies were converted into the public service Stiftung Berliner Philharmoniker foundation. In this way, the city also earns from the venture and the musicians are saved taxes. At the same time, Deutsche Bank was brought on board as a financial backer. Media manager Martin Hoffmann (born 1959) was named General Manager in 2010. Sir Simon combines his organizational talent with a charismatic personality, which soon made him a favorite with his orchestra and the audience – especially the younger among them. In 2002–2003, Rattle started his Education Programme, which gained international popularity through the documentary film Rhythm Is It! “It was, and still is something close to Sir Simon’s heart, and his firm belief, that the Philharmonie should be accessible to all nationalities and ethnic groups – something Berlin is particularly rich in …” (taken from the web site of the Berliner Philharmoniker). In addition, the knight of the realm conducts a youth orchestra with Berlin school pupils each year. The performance of Gustav Mahler’s never-completed Tenth Symphony, with compositional additions by Deryck Cooke, was particularly important to Simon Rattle. He is also credited with being the conductor who returned the work of Joseph Haydn, whose genius helped inspire Mozart and Beethoven, to the canon of classical music. “More than any other conductor, Rattle has attempted to make historically informed performance fruitful for the romantic repertoire. He has imported ways of playing from early music, and, in this way, made the Berliner Philharmoniker … it has to be said, the most progressive orchestra of its kind,” (quoted from Kai Luehrs-Kaiser on “Kulturradio vom rbb” on 11/23/2014). Simon Rattle will stay with the people of Berlin until 2018, when his contract ends. Who could be the next principal conductor? An exciting question – especially for the potential successors. Note: All facts stated in this article are based on written materials, from sources including Wikipedia. Quotations are expressly marked as such. Johannes Althoff: Die Philharmonie. Berlin Edition, Berlin, 2002, ISBN 3-8148-0035-4. Dietrich Fischer-Dieskau: Jupiter und ich. Begegnungen mit Furtwängler. Berlin University Press, Berlin, 2009, ISBN 978-3-940432-66-7. Annemarie Kleinert: Berliner Philharmoniker: Von Karajan bis Rattle. Jaron-Verlag, Berlin, 2005, ISBN 3-89773-131-2. Karl Löbl: Das Wunder Karajan. Heyne, Munich, 1978, ISBN 3-453-00827-8. Klaus Lang: Herbert von Karajan. Der philharmonische Alleinherrscher. M-und-T, Zurich, St. Gallen, 1992, ISBN 3-7265-6025-4. Cordula Groth: Das Berliner Philharmonische Orchester mit Claudio Abbado. With contributions from Helge Grünewald, Hans-Jörg von Jena, Ulrich Meyer-Schoellkopf. Nicolaische Verlagsbuchhandlung, Berlin, 1994, ISBN 3-87584-481-5. Frithjof Hager: Claudio Abbado: Die anderen in der Stille hören. Suhrkamp, Frankfurt am Main, 2000, ISBN 3-518-39662-5. Angela Hartwig: Rattle at the Door. Sir Simon Rattle und die Berliner Philharmoniker 2002 bis 2008. Evrei-Verlag, Berlin, 2009, ISBN 978-3-00-028093-1. PS: Double the enjoyment of your musical experience and share it with your Muse!